Luke made this deer toe rattler with the toes of several deer he had got. 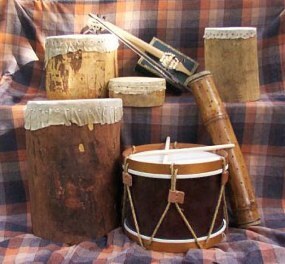 Bev made these logs drums out of hollow logs she had found and used the rawhide from deer for the heads. The cigar box fiddle was made by Luke. It really works! The long thing is a rainstick sent to us by a friend. We didn't make it, because rain-stick cactus doesn't grow in Pennsylvania - but somebody made it. The Colonial style rope drum was restyled by Bev from a modern day wooden tom tom she had picked up at a flea market. It has a canvas head and sounds decent. 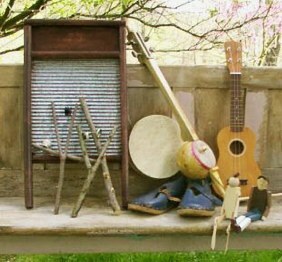 Here is a washboard. We made some rattlers from twigs, deer bones cut in circles, bottle caps, buttons - whatever will make a noise. There is a small hand drum with a deer hide head, a spike fiddle made from a gourd and a ukulele. The blue shoes are Welsh clogging shoes hand carved by a man in Wales. Sitting in front are Mr. Jiggly Bones, made by Bev from a wooden block and ice cream spoons. He has pennies for hands and feet and works like the clogging doll made by Luke. This clogging doll has traveled to many places with us and has danced up a storm at the hands of countless kids. He hasn't broken at all which attests to Luke's skill as a woodworker. Cigar box fiddle made by Luke. It sounds like a fiddle on an old 78 rpm Victrola record. The cornstalk fiddle made by Bev sounds like a cricket with laryngitis. Fiddlesticks! 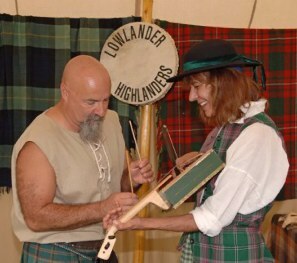 Luke taps out a rhythm using fiddlesticks as Bev plays a cigar box fiddle.